SpaRitual’s Spring 2017 collection, Inhale, comes in their new, 10-free, breathable nail polish. A 10 Free and All-In-One polish to nourish, lengthen, strengthen and brighten your nails. No basecoat or topcoat needed, just 2 coats of color. The new Nourishing Vegan Color Inhale Collection from SpaRitual is lightweight and breathable, allowing oxygen and hydration to penetrate the polish through advanced oxygen technology, which mimics a contact lens. 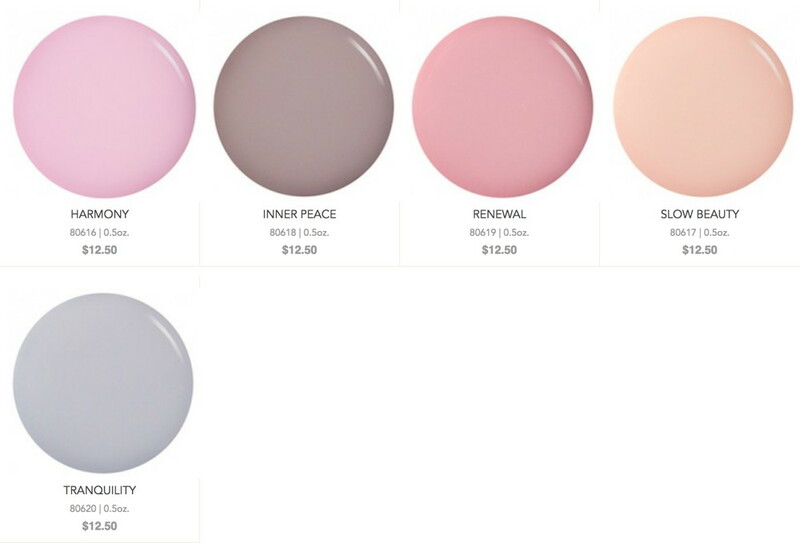 The new collection consists of 5 soft shades—everyone does soft shades for spring, don’t they? Nourishing Vegan Color is 15 mL and retails for US$12.50. The company is vegan and cruelty-free. SpaRitual was founded in 2004 by Shel Pink, self-styled “Lifestyle Futurist” and daughter-in-law of Orly founder Jeff Pink. The company is based in Van Nuys, CA, USA. I thought this was going to be a bit meh, but the shade selection is pretty, renewal and tranquility are my faves from this one … copying Jodi!